Hi School Pharmacy has a history founded in the tradition of the classic corner drug store. The original store, opened in 1925, was named High School Store due to its location across the street from Vancouver High School on Main Street, Vancouver, Washington. Because of its soda fountain and wide selection of candy and school supplies, it became a popular spot with the students. In 1939, two brothers, Ken and Matt Zapp, opened a pharmacy in the old Safeway building adjoining the High School Store. This doubled the size of the original store and greatly increased the variety of merchandise offered. More importantly, Hi-School Pharmacy, as it was duly named, became known as the place to have prescriptions filled. Hi-School Pharmacy/Hardware remains an independently owned and operated company. The phenomenal success that this company has achieved in a relatively short period of time is directly attributable to the high quality, courteous service given the customers by the Hi-School Pharmacy/Hardware team. 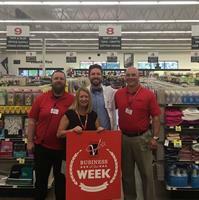 There is a great pride in what the name “Hi-School Pharmacy/Hardware” stands for in communities throughout the Northwest. It represents caring people, quality merchandise at competitive prices, courteous service and above all customer satisfaction. Our store is located on NE 52nd St between NE St. James Rd and NE St. Johns Rd in Vancouver, WA.